efficient polystyrene inserts. Each insert is heat-sealed with a poly vapor moisture barrier to protect your spa cover against water absorption. Inhibitors in both the vinyl & thread prevent premature aging of your spa cover, which all add up to a superior product. A: Once a month, clean and condition your vinyl with cleaner and vinyl conditioning cream - complete with UV blockers to help protect your cover from harsh sun. Vinyl can dry and become brittle which can cause wear on all the seams and stress points. 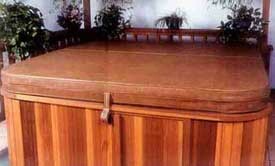 Q: What's the best method to clean the underside of the spa cover?